Berggarten Sage is a German cultivar of Salvia officinalis. The Sage Berggarten is a great evergreen perennial with a compact dense growing habit. 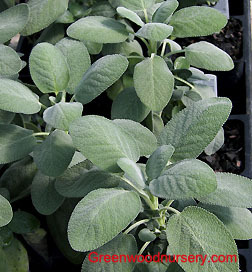 The large oval leaves of the Berggarten Sage turn soft fuzzy gray as they age. Plant sage in a well drained area and Is drought tolerant once established. Prune new growth only from the Sage Berggarten. Last pruning or harvesting should be in late summer or early fall to allow pruned wounds to harden before winter weather. Plant in full sun. Space sage plants 2 to 3 feet apart.